Laptops generated the largest sales in electronics on Amazon.com in Q1, while wearable technology and gaming accessories are delivering much of the growth, according to retail analytics firm Stackline. A glimpse at category- and SKU-specific sales figures on Amazon.com Inc. sheds new light on the power Amazon holds. For one, Amazon sold nearly $4.7 billion worth of consumer electronics products in the first quarter to U.S. consumers, according to retail analytics firm Stackline. To put that into perspective, that’s nearly seven times as much as Best Buy Co. Inc. sold online in the first quarter of last year (the merchant hasn’t reported Q1 2016 yet), and more than half of what Best Buy sold in all stores around the world during that same period. Stackline’s software scrapes Amazon’s websites and combines that data with retailer feedback to estimate sales at the SKU and category level. Its figures include sales of Amazon-owned goods, as well as sales from outside sellers on its online marketplace. Within the consumer electronics category, well-established product lines such as laptops, computer data storage and headphones generated the largest revenue during the quarter, though wearable technology and gaming accessories delivered much of Amazon’s sales growth. When Stackline began tracking SKU-level sales in the third quarter of last year, the wearables and gaming accessories categories combined to produce $247 million in sales, for example, slightly more than the $227 million in sales in the computer data storage category. Over the past 10 months, however, the growth of the former category has far outpaced the latter. As a percentage of Amazon’s total sales of electronics, wearables and gaming accessories grew to 7.1% from 5.5% since July 2015. Sales of data storage products shrunk to 4.4% from 5.2% since July 2015. In terms of Amazon-branded products, the Echo is outselling the Kindle so far this year, according to another e-commerce research firm, Slice Intelligence. 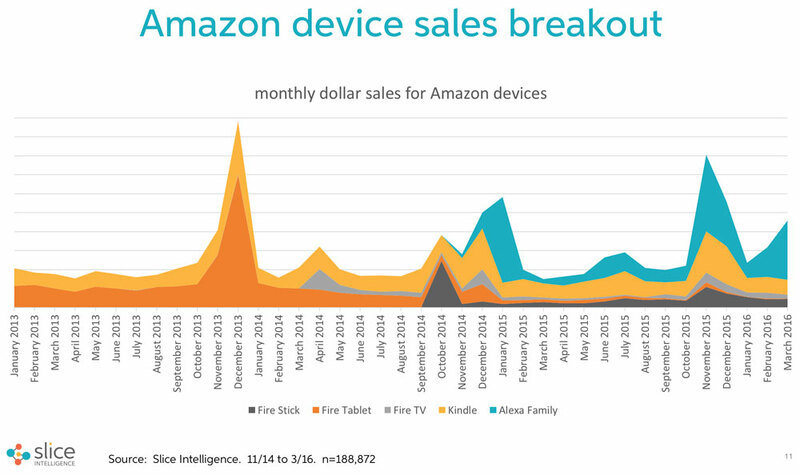 The Echo, a voice-controlled gadget that Amazon launched in November 2014, and its various accessories account for 26% of Amazon device unit sales and 41% of dollar sales, beating out the Kindle by seven percentage points. Amazon is No. 1 in the Internet Retailer Top 500 Guide.